Prof. Zhaxybay Zhumadilov, Gereral Director and PI of National Laboratory Astana, Nazarbayev University, Kazakhstan, companied by Prof. Tursonjan Tokay, Director of the Institute of Bioengineering, Regenerative Medicine and Neurophysiology of National Laboratory Astana, visited the Institute on Nov 17. Dr. ZHANG Yongqing, Deputy Director of the Institute, hosted their visit. 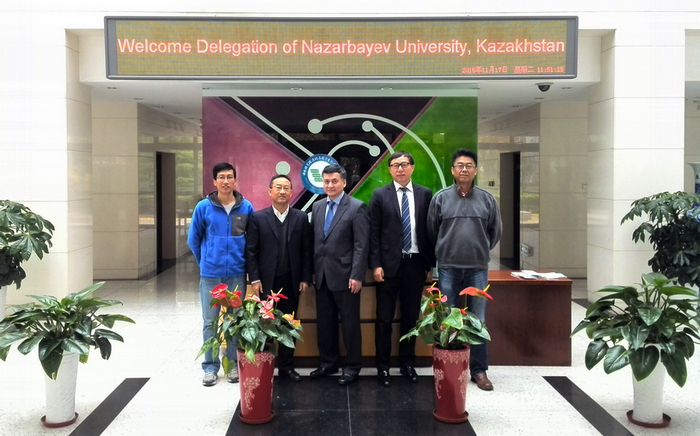 Prof. Zhumadilov delivered a introdction to Nazarbayev University and National Laboratory Astana. Dr. ZHANG Yongqing gave a brief introduction of the institute, too. The collaboration in biomedicine between Nazarbayev University and the Institute was discussed then. Dr. XU Zhiheng and Dr. GUO Weixiang from the Center for Molecular Developmental Biology attended the discussion. Both parties hoped to establish a collaborative partnership in the near future. Nazarbayev University is an autonomous research university located in Astana, the national capital of Kazakhstan. Founded as a result of the personal initiative of the President of Kazakhstan, Nursultan Nazarbayev in 2010. It is an English-medium institution, with an international faculty and staff. The university currently consists of six schools: the School of Engineering, the School of Humanities and Social Sciences, the School of Science and Technology, the Graduate School of Business, the Graduate School of Education, and the Graduate School of Public Policy. Nazarbayev University offers a variety of undergraduate and graduate degrees, from bachelor to Ph.D degrees.